Happy belated International Macaron Day!! And yes, it’s macaron, not macaroon. Honestly, I didn’t really know the difference until sometime late last year after getting all confused and deciding to do some research into it. But what I’m talking about here aren’t the coconut macaroons, but those colourful Parisian desserts that are made with almond flour. And I believe there is a difference in pronunciation too, but I guess most people don’t realize. So yes, International Macaron Day was on March 20th, and honestly, I did not know about this big day until Steph told me. She is clearly the bigger foodie here! So yes, of course we had to celebrate and get some macarons! 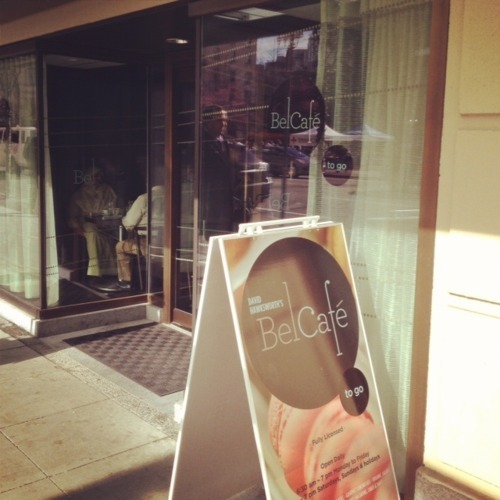 We wanted to go to Soirette but it was kind of far from where we were, so I did a little googling, and off we went to Bel Cafe. And we discovered it was actually right next to Hawksworth, and is the sister cafe to it! So they are both situated in the Rosewood Hotel Georgia. Honestly, I’m not a crazy fan of macarons as I think there are tons of other desserts that are more worthy, but Vancouver has been on a macaron craze these past few years. Everyone talks about them, and I’m no expert to judge which ones are better. The rose and raspberry macaron definitely had a very strong rose taste to it, but I actually didn’t really taste any raspberry flavour. I did like the strong rose flavour though, as I love rose flavoured desserts! 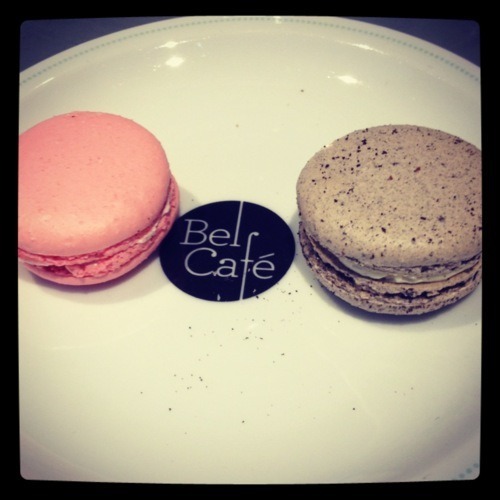 The cookies and cream macaron was really good too. You could totally taste the cookies and cream flavour with a strong vanilla flavour as well. Almost tasted like a chewy Oreo! Overall, they had a consistent smooth texture with a little chewiness inside which I like! 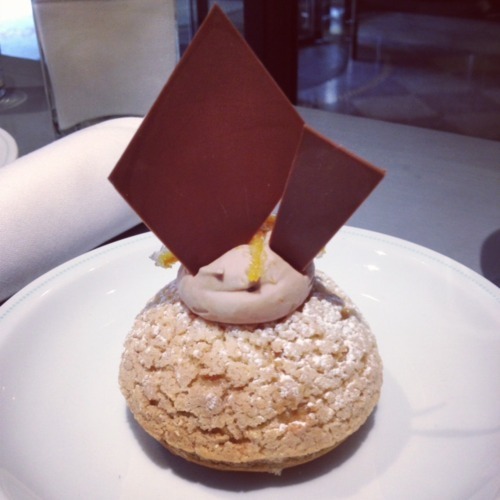 Next, we also got the Crispy Choux, Orange & Milk Chocolate Ganache. It was basically a cream puff with a strong orange flavour to it. Not bad, but I found the puff a little tough, but I think it was supposed to be the “crispy” part of it. Service was exceptional, and the cafe is extremely busy! We almost couldn’t find a seat and had to go for take out. Busy busy cafe with exceptional desserts and savoury items as well!